What Day Of The Week Was July 17, 1998? 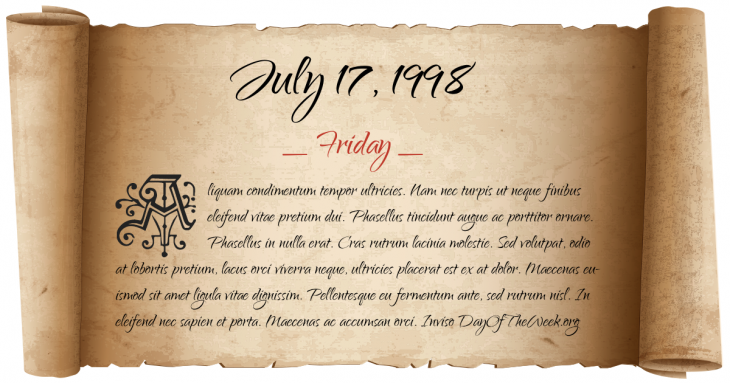 July 17, 1998 was the 198th day of the year 1998 in the Gregorian calendar. There were 167 days remaining until the end of the year. The day of the week was Friday. A person born on this day will be 20 years old today. If that same person saved a dollar every day starting at age 5, then by now that person has accumulated $5,757.00 today. Here’s the July 1998 calendar. You can also browse the full year monthly 1998 calendar. Papua New Guinea earthquake: A tsunami triggered by an undersea earthquake destroys 10 villages in Papua New Guinea killing an estimated 3,183, leaving 2,000 more unaccounted for and thousands more homeless. Who was born on July 17, 1998?